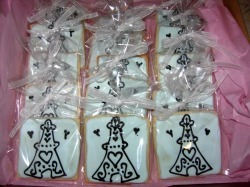 Cookies make GREAT favors! Not only do they add to the theme and decor of your special events, but they are also appreciated by guests as an adorable treat... not a trinket that they will feel obligated to hang on to. Cookies make AWESOME thank yous! Next time you want to thank your staff, colleagues, or clients, say it with cookies! Cookies make FUN gifts! Need a cute housewarming gift? Christmas prezzie or birthday token? A dozen personalized cookies, or a customized gift basket would put a smile on any recipient's face. In short, personalized cookies cost no more than a greeting card, but are a stylish and fun way to spread some cheer!